When the Earth Federation Forces captured the Pezun asteroid base towards the end of the One Year War, they unearthed a treasure trove of new state-of-the-art mobile suit schematics that the Principality of Zeon were developing. 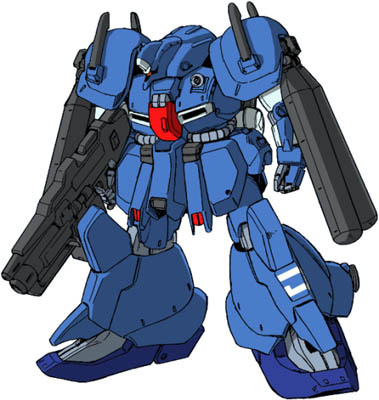 One of the Zeonic designs discovered at Pezun in the five years following the One Year War was the "X Series" mobile suit development project. When the "X Series" data was discovered it as handed over to the lunar-based mobile suit construction firm, Anaheim Electronics, where the data was redesigned into the RMS-141 Xeku Eins and several units were built and sent to the Pezun asteroid for test piloting. 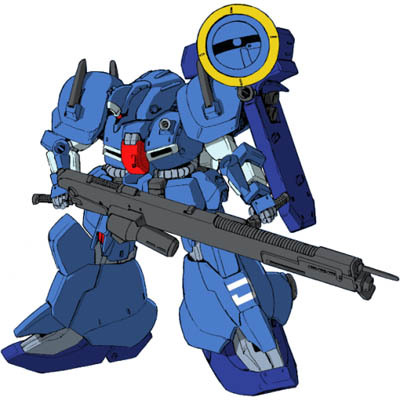 In UC 0085, the Federation Forces establish an instructor corps at Pezun to develop new mobile suit tactics and piloting techniques, providing an additional source of development data. The end result of this research is the RMS-141 Xeku Eins, the first machine in an experimental "X series." 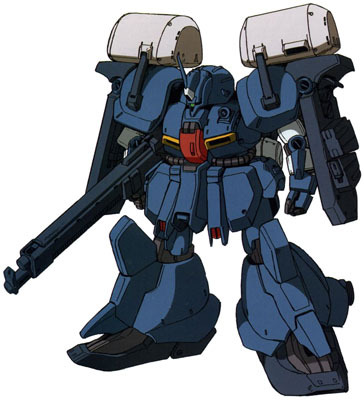 The design of the Xeku Eins is based on reliable, proven technology, and despite its good overall performance the mobile suit itself has few distinguishing features. However, its sturdy frame and high generator output allow it to carry a large weapons payload, and the multipurpose latch and mount system built into its shoulders allows the Xeku Eins to carry a wide variety of optional equipment. As a result, this general-purpose mobile suit can reproduce the abilities of many different specialized machines. As such, it has become one of the prized mainstay designs of the Vist Foundation. Currently there are three known configuration for the Xeku Eins. The Type 1, which is the most basic configuration of the Xeku Eins. Using beam rifle with an attached grenade launcher, and mounts on its shoulders landing devices and propellant tanks. Technically, it's also possible to replace the propellant tanks with shield in order to arm the Xeku Eins with beam sabers. After that is the Type 2, which is armed for long-range attack, utilizing a long-range beam smartgun with a disc radome on its left shoulder. And then finally there is the Type 3, which is a heavy attack configuration. Originally intended for attacking and defending space fortresses, this type is armed mainly with projectile weapons. Its main weapon is a large 120mm machine gun with a rate of fire of 360-540 rounds per minute, and it carries roughly 6000 rounds of ammunition in each of the huge drum magazines attached to its shoulders. Similar to type 2 equipments, this configuration has a pair of shields mounts in its shoulders, holding beam sabers and latches for optional equipment such as clay bazookas, bazooka magazines, and smoke dischargers.